Thinking of a basement renovation? If your basement is cluttered with stuff you “might use, someday” or if it resembles a dark-paneled ’70s dive-bar festooned in red velvet it’s well worth remembering that a basement is a big area that runs most of the way beneath your entire house you could be utilizing. A basement doesn’t have to be a subterranean man-cave anymore: it can be a beautiful area of the house you (or a renter!) can actually utilize every day. Gone are the days when you could hang up some ultra-thin walnut-ish paneling and call it a “rec room”. A truly modern and usable basement should meld with the rest of the house, without looking like an after-thought. If your somewhat handy, you can still do some of the work yourself, but as homeowners demand more and more from their basements, often times the project will demand the experience of basement renovation professional. What’s your basement square footage? Finishing your basement without first checking for water problems is obviously not a smart move: once wood and drywall get wet, you’ll be starting over from scratch. Although older homes might be more famous for water issues, we’ve seen a lot of new homes (less than 10 years old) that are just as likely to have them. You’ll want to check walls and floors for cracks, humps, wet spots or flaking, all of which can indicate damage or potential damage to come. These issues MUST be addressed before any basement renovation is started. Sometimes the issue can be rectified with a simple patch or water proofing from the inside, other times the foundation must be dug up and water-proofed from the outside, which could really scuttle your basement renovation budget. Be sure to have a professional inspect your foundation if you have the slightest doubt regarding its integrity. Installing a bathroom or kitchen in your basement? Plumbing for basement bathrooms or kitchens can really take a bite out of your budget. Older homes may not have rough-ins for bathroom plumbing at all and even newer homes may not have the rough-ins where you want them. Moving or installing drainage plumbing can often mean chipping up the basement floor; which, isn’t nearly as much fun as it sounds. And, it goes without saying that cabinets, fixtures and counter tops will take you to new plateaus in basement budget planning but are essential if your basement renovation has renters in mind. Do you need an escape window in your basement? Many building codes require that there be some way to exit the basement other than the main staircase in case of fire. This “escape route” could be a door that leads directly to the outside of the house or could be what is called a “egress” window. An egress window must have a minimum open area (minus framing and any immovable element) of no less than 15 inches in any dimension: that is, someone has to be able to escape from it. Although the window doesn’t have to be in a basement bedroom, inspectors are going to be especially on the look-out for a properly sized window if you do have a bedroom in the basement. If you don’t have a proper egress window, digging out the foundation and blowing through the concrete to put one in can get pretty expensive. Make sure you have either a second door or a big enough window no matter what your plans for your basement, but especially if you are planning for renters or have a basement bedroom. What kind of flooring would you like in your basement? Unless you want to paint your bare basement floor with shiny grey concrete paint, you’ll want to consider flooring as a major basement renovation budget element. Simulated wood laminate is a step above concrete paint, but it won’t last as well as engineered wood or tile, which is more expensive. If you’re considering hardwood for the basement, keep in mind that wood is very susceptible to moisture–so make sure everything is sealed well and humidity levels are stable. Also, hardwood can’t be nailed to a concrete floor, so either buy hardwood that “floats” over a sealed floor or consider hardwood that can be glued down (which is much more expensive to install or remove, but feels much more solid than floated hardwood). A common money saver–and one that adds warmth to the basement– is to install a good quality carpet. After you’ve considered the “big five” factors we’ve mentioned and thought about what you’d like to do with your basement, it’s a good time to call a professional. He or she can advise you and help you get what you want out your basement while letting you know which projects you might be able to tackle yourself and which to leave to some one else. Whatever you decide, just remember that a basement is a terrible thing to waste. 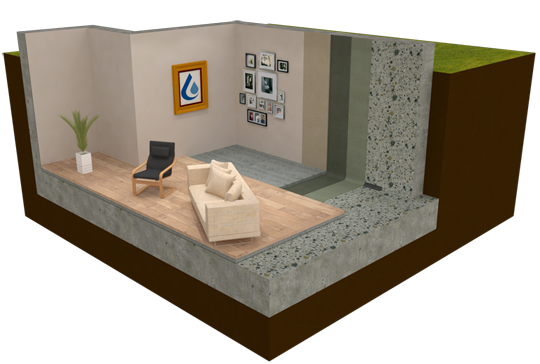 For your free basement quotation, email info@bellconinteriors.ca or call us at 416.420.6648.